Whether you’re an Atlanta area business owner, an executive in Alpharetta, or a purchaser in Marietta, building the perfect office is all about balance. You can buy the world’s fastest and most amazing computer, but if you don’t have an organized work space, you won’t be as efficient and effective as you could be. Luckily for you, NorthPoint Office Furniture has a large inventory of computer desk options to suit your needs. Our massive selection of computer desk options is sure to contain desks that can fit almost any specifications and budget constraints. 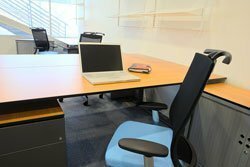 Plus, NorthPoint Office Furniture only carries desks from quality manufacturers and top-of-the-line brands such as DMI, Martin Furniture-Kathy Ireland Home, Office Source, HON, Global, and Cherryman, so you know any furniture you purchase from us will be well-made and stand the test of time. NorthPoint Office Furniture offers a lot more than just computer desk options, however. We have everything you need to round out your perfect office, including conference tables, reception desk options, desk chair products, and filing cabinets. Of course, our computer desk selection isn’t just for the office. Bring one home to add a dash of class to your study or computer room. Also, with NorthPoint Office Furniture, you’ll never lose a weekend putting a desk together. Assembly is always included in the price of our items. Stop by our 8,000-square-foot Roswell showroom to check out our line of computer desk options. Talk to a sales representative and see what your office could be via our fully realized demonstration offices.